She says she told Prentice the budget wouldn't fly. 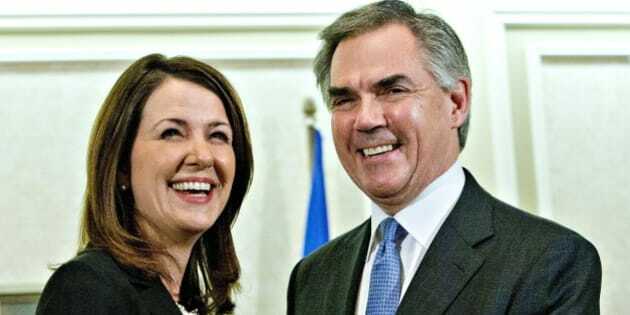 EDMONTON - Former Wildrose leader Danielle Smith says she now realizes she was very naive when she crossed the floor, and says that she was sold a bill of goods by former premier Jim Prentice. Smith says when she and 10 other Wildrose MLAs almost collapsed their caucus by joining Prentice and the Progressive Conservatives in December, it was because they thought Prentice was fiscally conservative. She told a talk-in radio show (CHQR-CHED) that she later privately complained to Prentice when he brought in a budget that hiked taxes and held the line on spending. She says she told Prentice the budget wouldn't fly and that the document helped his opponents during the election. Smith also says she originally tried to convince Prentice not to run for the PC leadership, saying she thought his party was too scandal-ridden to win. Smith ran for the Progressive Conservatives but lost the nomination for her riding in Highwood in March.